An ESOP is the most cash- and tax-efficient succession plan available to business owners. We make selling to an ESOP easy! Our 4-step ESOP process lets you ease into the ESOP waters with confidence. ESOP Partners’ Succession Advantage™ Ownership Transition Process is among the fastest methods for completing a business transition and realizing the benefits. A traditional business sale can take up to 2 years to complete, compared to just 60-90 days when you sell to an ESOP with ESOP Partners. You get your cash out sooner, and start reaping the tax benefits faster. The steps involved in selling to an ESOP are straightforward, and each critical to the long-term success of the plan. 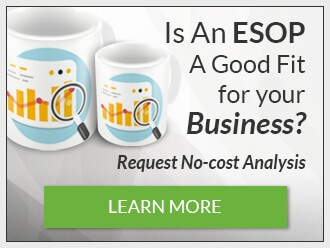 ESOP Partners has a proprietary process that begins with a feasibility consultation that will tell you if an ESOP is a viable solution based on your unique situation. Find out if an ESOP might be right for you with this no-obligation, no-cost feasibility analysis. The Management. Articulate how the ESOP can be used to reward and incentivize key management and also for retention and recruiting. The Participants. Modeling the employee benefit level the plan will provide. This step is the point at which the value used in the modeling is confirmed by an independent valuation firm. This is another point where ESOP Partners’ approach saves you money and time by not involving unnecessary parties in the process. In this final step we offer guidance through the transaction closing and actual sale of stock to the ESOP. This includes developing the plan design (who is in the plan, when they get in the plan, when they get paid and how they get paid) and a communication strategy for employees, vendors, clients and the marketplace in general. With a streamlined transaction process and extensive network of ESOP professionals, we’ve made an ESOP an even more attractive tool for succession planning. We also leverage the expertise of ESOP counsel and other professionals when needed (and only when needed) to maximize the effectiveness the ESOP implementation team – while staying within your budget. ESOP Partners works aggressively to prevent delays or stalling that sometimes occur during the transition process. We anticipate where those hurdles can pop up and know how to avoid or quickly remedy situations to keep things moving swiftly and smoothly. We have extensive experience with ESOP feasibility, transaction structure, plan design, implementation, and ongoing ESOP administration – and we use that experience to quickly complete a successful sale with optimum benefit to both the business owner and the company. - Dave, Former CEO and owner, MCD, Inc.
Every client is assigned a single point of contact to manage the ESOP process from start to finish. This professional is always available to address questions with clear, straightforward answers, even after the sale. "...I cannot say enough good about our representatives at ESOP Partners and their patience and guidance during the first year of our ESOP. The response to any question was almost immediate. ESOP Partners has given me confidence in handling the tasks required of our ESOP."